Summary: Are you looking to grow the youth programming and visibility at your site? If so, this collection highlighting seven NWP sites’ creative, and often revenue generating, programs and opportunities for youth could provide the spark and inspiration you need. Several unique partnerships with the Scholastic Arts & Writing contest are shared, as well as out of school work with refugee students, a Saturday showcase, and publication day for teens. Prior to the RRVWP and Plains Art Museum serving as state affiliate, there were only 20 or so entries from the entire state of North Dakota, meaning that very few students were eligible to compete for national level awards. Through our efforts to publicize the awards, participation increased to 120, and we expected a greater increase in the coming year, as word spreads. We publicized the state award winners through our blog. 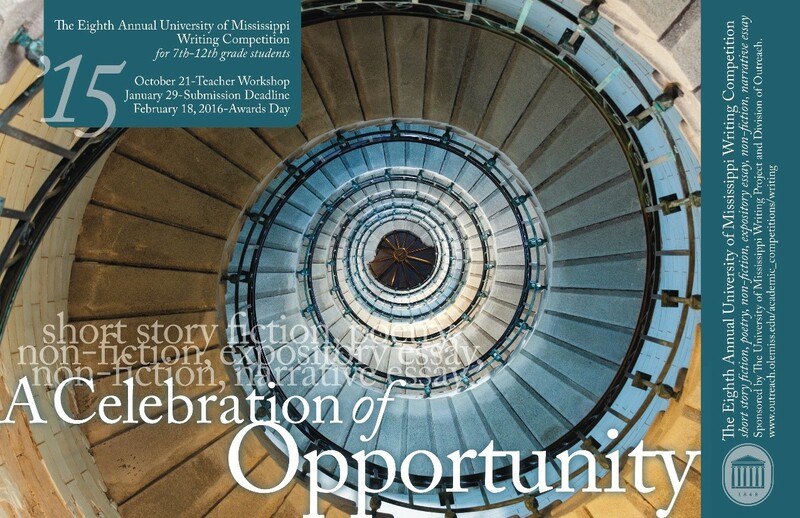 The University of Mississippi Writing Project Writing Competition integrates teacher workshops and scholarships to their young writers camps. It also enables the site to collaborate with the campus academic competitions program. We began the UMWP Writing Competition in 2009 in partnership with the Academic Competitions program here on campus. The project consists of an initial teacher workshop, presented for free by the UMWP director, which spotlights writing strategies for classroom instruction. The proceeds from the workshop go for the printing of the Writing Competition posters (teachers actually fight over these posters) and lunch for the TC scoring team. Last year, four TCs scored over 500 student entries. The students and the teachers are invited to campus for the winners to read their entries. The top three in each category are awarded a certificate and a scholarship to one of the summer youth programs directed by the Academic Competitions program. For the UMWP, the competition provides us with a wonderful marketing opportunity, a professional development offering, a continuity program, and an opportunity to see writing strategies integrated into student submissions. Hoosier Writing Project benefits from the co-sponsorship of a writing contest in a variety of ways. One vital program for HWP is our co-sponsorship of the Scholastic Art and Writing Awards for central and southern Indiana. We partner with the education division of Clowes Memorial Hall at Butler University in Indianapolis. The Clowes education staff focus on the art awards as well as providing considerable leadership and administration of the program. They have involved art and English faculty at Butler. At IUPUI, where HWP is located, we have had the support of the Office of Community Engagement, though with reorganization of their office, their support will primarily be financial moving forward, as they focus more on corporate education. We have been working more closely with the new School of Liberal Arts recruiting office, and also hope to engage the English Department in seeing these awards as an opportunity for community engagement and in particular recruiting potential English majors from area schools. We have recruited writing contest judges from our TCs and from IUPUI Writing Program instructors and graduate students, as well as area writers. TC Sara Harrell, a Writing Program lecturer at IUPUI, works closely with Director Fox in planning and administering the writing awards. We also promote the awards at the ITW conference. We produce a high-quality print anthology of winning student writing, utilizing the services of a graduate writing lab at Butler University. We also had another excellent writing workshop for winning students before the awards ceremony, facilitated by an IUPUI adjunct faculty member (who teaches in the Writing Program Fox directs but also in the Creative Writing Program and is a published writer). Through the Scholastic Awards, we have reached out to various community arts and humanities organizations, which should increase the visibility of HWP and potentially open other doors for partnership. We’ve been running a writing contest for K-12 students for 27 years. We had 1,300 student submissions last year and published about 80 students in the magazine, and honored all the students at a Recognition Night ceremony on campus in May with local author Heather Webb as the keynote speaker. We had 28 teachers work as readers to score the submissions, and had two TCs, our GA and two interns do all the copy editing, proofreading, and layout of the magazine itself. This was pretty much unchanged from what we have been doing for years. But we did a couple of things differently this year that worked out really well. For one, we have been working with Scholastic for the last few years, hosting a Region at Large scoring site, with 20 or 25 teachers reading and scoring submissions. It’s a nice Continuity/Recruitment activity and Scholastic gives us about $2,500, which we can use to defray the costs of printing our own magazine. But from our experience working with Scholastic, we borrowed a couple ideas from them. One was to award more honorable mentions, which really made sense when we looked closely at our student submissions and how many students got fairly high scores from the TC readers. In some grades (middle school, mostly) we had literally dozens of kids getting scores of 7 or above (on a scale of 10) but not getting selected for even honorable mention because we were setting our numbers too low. So we awarded many more honorable mentions but without lowering our standards, just by setting a cut score (an average of 14 from two readers). In all, we honored 250 students, up from 170 the year before (and still out of 1300!). The other idea we borrowed from Scholastic was to give Gold, Silver and Bronze awards to teachers who had multiple students honored in the contest/magazine. In previous years, we had always acknowledged the teachers of published and honored student writers in the back of the magazine, but this year we also counted to see who had three, four, five, six, or more students published or honored. One teacher even had 8, and one had 14! In all, there were 21 teachers (out of more than 500 who submitted student work) who had between 3 and 14 (an obvious statistical outlier!) published or honored. We gave them their own awards and sent letters to their building principals. We named them on our website and in a press release, and for those who ere not already TCs, we invited them to attend the SI. K-16 teachers find a lot of support offered by the Illinois State Writing Project. In addition to the Summer Institute and other classic Writing Project professional development, the TCs of the ISWP reach out to students and teachers through conferences, writing centers, and a strong relationship to the University Writing Program, where TCs have been focusing on genre awareness. The Writing Center support offered by the ISWP goes beyond the Illinois borders. Co-director Richard Martin created a website that makes available all resources he has created during the design and delivery of the Writin’ Titan Writing Center at El Paso-Gridley Junior High (writintitans.weebly.com). The website supports the program administration of Teacher Consultants in our Network but is also a resource available to the wider public. Already, Rich has begun to assist teachers in states as far as Florida. The teens who work with the ISWP are learning to relate to texts in different ways. Students were invited to a showcase with writing workshops and a chance to share their works, including a bound book. On Saturday, April 18, 2015, the Illinois State Writing Project and the ISU Publications Unit co-sponsored an inaugural Young Writers’ Showcase for middle and high school students, their teachers, teacher candidates in English, and graduate students in the Department of English. Fourteen students from eight area schools took part in workshops that addressed poetry writing, multimodal creative writing, video poetics, and desktop publishing. Fifteen teachers, including TC members of the ISWP Writing Centers Network, accompanied young writers from their schools, joining eight teacher candidates in English, who assisted workshop presenters. Prior to the Showcase, Teacher Consultants were encouraged to recruit aspiring young writers in their schools, to solicit short fiction and non-fiction pieces, and to engage with writers in editing the work for publication. Co-director Evan Nave served as editor of the chapbook, overseeing all aspects of design and printing with the assistance of teacher candidate Brent Fisher. During the final workshop of the Showcase, Dr. Steve Halle, director of the ISU Publications Unit, provided instruction that engaged writers in hands-on assembly and binding of the collections. Students were provided two copies at no cost. The Showcase ended with a formal reading in which all but one writer volunteered to share their work. Feedback from participating Teacher Consultants indicated the process of publication and sharing was profoundly impactful on many of the participants’ aspirations and sense of social connection. Kennesaw Mountain Writing Project created a writing contest to honor a writing project fellow who created community in her classroom through place-based writing. The program continues to develop and grow. “The Leslie Walker Writers of Promise honors KMWP fellow, Leslie Walker, who made it her mission to create community in her classroom through writing about place. The work of the Writers of Promise contest represents an ongoing effort to continue Leslie’s work. Annually, we invite teachers to prompt their students to experiment with writing about a specific place. What students choose to express in their writing may be factual, imagined, or a combination of both. The contest was opened for submissions on February 10, 2015 with a deadline of April 14. We received over 74 submissions from high school, middle, and elementary students, and a team of volunteer judges ranked the submissions. Our top winners from each group were recognized at the KMWP Annual Awards luncheon in June.